Cats do not view it as the new litter box, unlike wood mulch. Buying 25 or 50 bags? 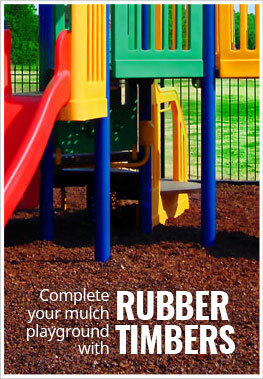 Then check out our Playground Rubber Mulch - Bulk. We had a unique challenge with our backyard playground. A friend gave us a giant, used Congo Monkey 3 Play Set for free. All we had to do was take it out of their yard and reassemble it in ours, with a promise that we would replace all the horizontal surfaces of the apparatus, which had become water logged and sagging. The upright lumber (Polymer coated wood) was perfectly intact. We were able to locate the necessary lumber and as well as new swings, trapeze bar and climbing rocks. We also added the new small deck, which makes it into a Congo Monkey 4. Then we had to figure out how to fit it into the available space, without overwhelming the existing landscape. We had a large kidney shaped lawn, a two-level stamped concrete patio, and two large half-circle garden beds, with cement curbs curving into the lawn. A smaller curved cement curb contained a sandbox. We were able to obtain the measurements of the Congo Monkey structure from the manufacturer, and using the specs and some old tarps, we made a footprint of the structure, so we would try it out in different spaces. It was too large to center it in the lawn area. There would not have been enough of a safety perimeter for the equipment, and the back of the lawn is bordered by a stacked stone and boulder retaining wall. 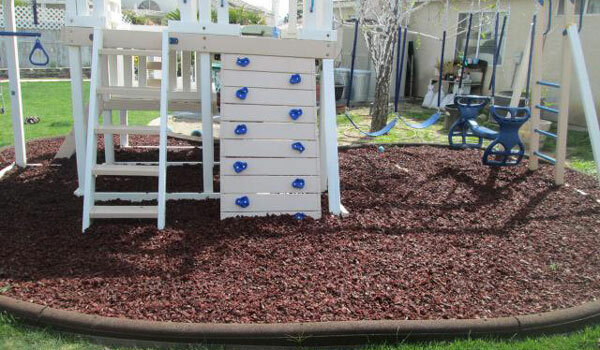 We researched many play surfaces before deciding on FlooringInc Rubber Mulch. Although many options are available, nothing offered the protection from falls that 4 inches of rubber mulch did. 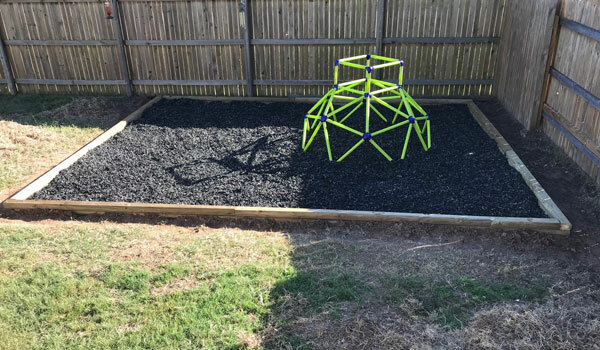 The price, although expensive, was competitive, considering it would have taken three times as much of another product to achieve the fall protection offered by the 4 inches of rubber mulch. (12 inches of sand or wood bark.) The company promptly responded to our request for product samples, offered quick delivery and free shipping. The slides empty onto thick rubber mats in the sandbox or on the grass. 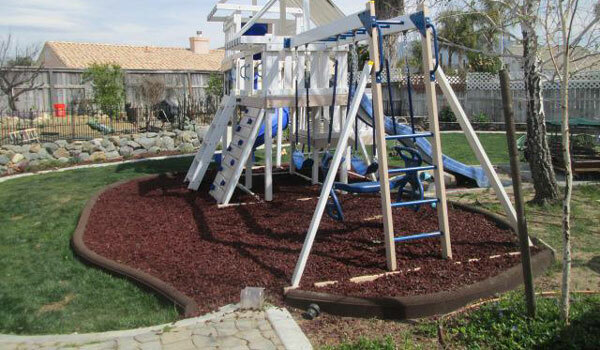 The entire play structure is surrounded by a 6 inch rubber curb, which is filled with rubber mulch. OMG MY PLAYGROUND IS NOW POPIN!! it was just as advertised. it was easy to install and worked great.